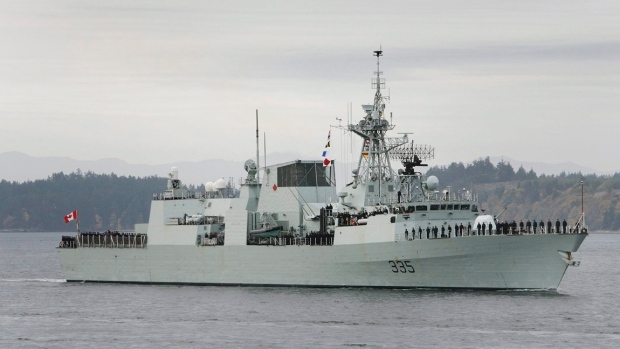 VANCOUVER -- Federal crews are keeping an eye on a 30,000-litre fuel spill from a navy ship in the waters between Vancouver Island and the Lower Mainland. HMCS Calgary was sailing near the Georgia Strait traffic lanes when fuel spilled from the vessel. Maritime Forces Pacific has launched an investigation to determine the cause of the spill, which involved F76 naval fuel. "F76 is a marine distillate. It is light in nature and is extremely similar to kerosene. This type of fuel will readily evaporate in the marine setting," navy spokeswoman Lt. Melissa Kia said. She said HMCS Calgary circled back on its path to look for any indication of the spill and aircraft looked for any sheen from the sky. The navy has booms and pads ready for cleanup, she said, but it's likely that most of the fuel has already evaporated. A statement from the navy Sunday afternoon said it's too early to know what impact the spill will have on fisheries and local marine life. It has placed a crew at Nanoose Bay on alert and advised Western Canadian Marine Response of the situation. The Canadian Coast Guard and Environment Canada are also supporting the navy. "The response is ongoing until we have confirmation that everything is good," Kia said. "We will keep looking and doing our due diligence." Anyone who sees signs of the spill is asked to contact the Regional Joint Operations Centre.